Morning host of Classical Music, Art Scene, Early Birds, and other WVIA programs, Erika Funke is a Senior Producer and Classical Music Host at WVIA-FM. “ArtScene”, her award-winning daily arts program, features interviews with creative individuals from the region, the United States and abroad. She has produced many programs about the history of northeastern Pennsylvania and its residents. Her radio play “Who Pretender Is, Or Who Is King” centers on the lives of the residents of Laurel Run, a borough outside Wilkes-Barre, plagued by a chronic mine fire. 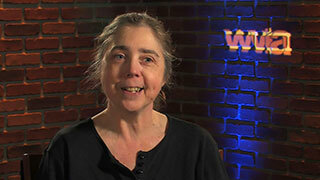 The piece was recently produced by The Northeast Theatre and broadcast on WVIA-FM. Erika also has television documentaries to her credit. She wrote and narrated a documentary on the Knox Mine Disaster that happened in the Wyoming Valley in 1959. And an Emmy-nominated documentary on Mozart that looks at the composer and his music in the context of the cities that were important in his life. She is a Phi Beta Kappa graduate of University of Chicago and received a master’s degree in Humanities (Interrelationships in the Arts) from Penn State University. She served on the PA Humanities Council for two terms and often speaks in the community about the arts and our lives.